Jorge Alfaro is the Only Marketable Asset the Feesh Have. So Let’s Market Him. 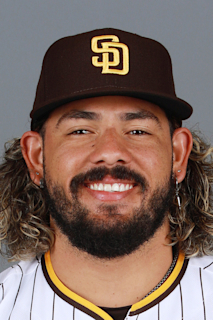 Alfaro has emerged from this “rebuild” nightmare like an Orc from the mud, as the closest thing to a hero the Feesh have. He has a couple of major assets: (1) He’s one of the few products of a teardown trade to begin to look like a stud, and (2) he has a kind of shaggy machismo that would appeal to anyone tough enough to stick with this team, kinda like a hirsute Schwarzenegger in Conan the Barbarian, and (3) he ackcherley plays well. he’s got power to spare, he runs very well despite his fireplug-like build, and he throws bullets with serious accuracy. I’d start by posing him in a mammoth fur uniform (from the knees up) with cleated musk ox leather sandals and a rough-looking baseball bat. Think of him as a latter day Alley Oop or pick him a catchy nickname like “The Thagomizer.”* Pretty soon you’ll have fans picking up on this riff and showing up in caveman outfits of their own with his number on the back. It can’t miss. Hey, like it or not, for all the hype of our Lord of the Flies pitching squad, this guy is quite simply the only draw we’ve got. “You could look it up.” – the Perfesser.